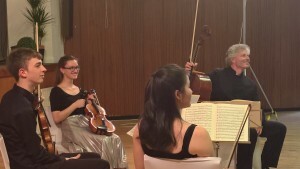 More than 100 people attended the Hampstead Synagogue Community Centre on Sunday 9 July to hear a recital given by Robert Max (cello), Hana Mizuta-Spencer (violin), Tim Crawford (violin) and Alinka Rowe (viola). 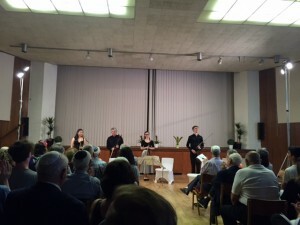 They played Samuel Alman’s Fuga Fantastica for string quartet and was the first public performance of the quartet since the 1950s. The music of Alman has a special meaning for Hampstead Synagogue as he was the choirmaster of Hampstead synagogue from 1917-1947. Beethoven’s string quartet in B-flat, op.130 was one of his ‘late’ quartets. Robert Max spoke about the work and Beethoven at the time of writing this quartet. Refreshments were served after the recital when the audience was able to relax and speak with the musicians.